NOTE: Another class has been added on Tue 6/18. Please visit that date on the calendar to register. Thank you! Sweet, petite and delicious! If you’re like us, and you’re obsessed with these delicate, beautiful and classically French cookies…then, this is the class for you! Tonight's experienced instructor, Nora Kaschube, is a graduate of The French Pastry School with a L’Art de la Patisserie degree, so you’re in for a real treat! 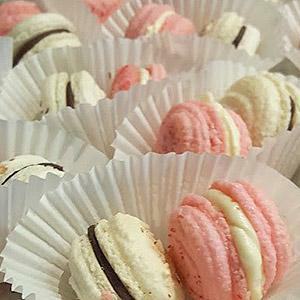 She’s eager to teach her expert tips and fancy French baking techniques as she walks you through the steps to make exquisite Macaron, using the French meringue method -- colorful, crispy cookie “sandwiches” filled with just about anything from flavored Buttercream and Royal Icing to Ganache. She’ll also teach you how to add flavoring to the cookie shells, and create several versions of ‘made-from-scratch’ fillings. We’ve limited enrollment in this class, so you can get loads of one-on-one time with Nora. So, tie on an apron, and let’s get going. You’ll take home some macarons to share with your family, as well as the confidence to create more of these tasty gems! Oui Oui!